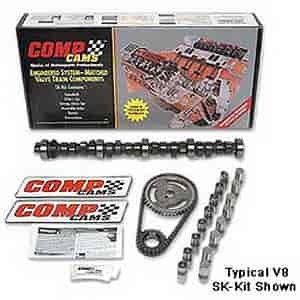 COMP Cams Magnum Mechanical Roller Cam Small Kit Chrysler 273-360ci 1964-2000 Lift: .575"/.575"
Magnum Cams are very aggressive and specifically designed for the street enthusiast looking for more power with that Pro Street sound. Intended for performance oriented vehicles that will see little street use. The idle characteristics of your engine will change due to the increased duration and overlap of the Comp Cams Magnum Cam Series. You will notice a racey idle with the 282-grind while the 294 and 306-grinds will produce a rough or ''rumbly'' idle. Stock components are generally incompatible. Changes are needed in rear end gear ratios, headers and the torque converter. Magnum Cams will affect your power accessories to a certain extent. The 280 and 292-grinds are the biggest cams that should be used with power assisted brakes, air conditioning, etc. You should remember that the bigger the engine is, the less the cam will affect the vacuum which affects your power accessories. The smaller your engine is, the more the Magnum Camshaft will affect your power accessories. Most late model vehicles have a vacuum canister. If your vehicle does not have a vacuum canister, it may be necessary to add one. Does COMP Cams SK20-702-9 fit your vehicle?